I've been saving this gem in celebration of NEXIS's release tomorrow. The song, along with the video, are perfect accompaniments to your read. I've just overwhelmed by the sheer number of people involved in this, how beautiful they all sound together, and the way the internet brought them together. A perfect NEXUS if I've ever seen one. ENJOY!!!! 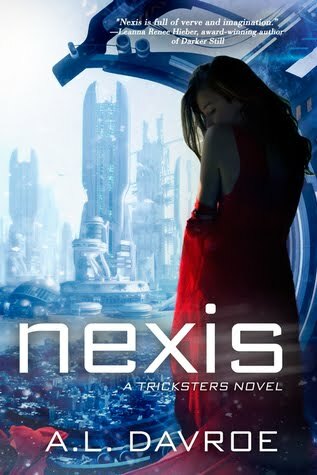 If you haven't yet, make sure you enter to win a free copy of NEXIS on Goodreads! My first NY release, NEXIS, is going to be coming out December 1, 2015. That's only two weeks from now! To celebrate I have a whole bunch of things lined up for you guys. Don't miss any of the action; check back here, on my Facebook, and Twitter to be involved. November 8-27: Entangled is hosting a Goodreads giveaway of two copies of NEXIS. December 1: A.L. and some of her best YA/NA author buddies are hosting a Facebook release party for NEXIS. Stop in, chat, enter to win tons of prizes throughout the day. To get an invite, friend me on FB and let me know via DM! December 1: NEXIS Thunderclap hits at 1pm EST. Join the noise to help support the book! December 1-14: NEXIS Grand Giveaway is active. Prizes include a Kindle Fire HD 7, Amazon gift cards for both National and International participants, a Nexis goodie pack, and the chance to customize a character in the next Tricksters book. Check in daily to increase your odds and please share with friends and followers. December 2-6: A.L. is doing a driving tour to local Barnes and Noble stores throughout the Northeast. If you live in MA, NY, NJ, RI, NH, north eastern MD, or eastern PA keep an eye out for signed books on your store's shelves! CT residents, A.L. will be signing at Barnes and Noble during various times throughout December and January, check her blog for exact times. December 16: A.L. is doing a Reddit AMA on the /r/books page. PLUS MORE EXCITING THINGS TO COME! NEXIS: In the domed city of Evanescence, appearance is everything. A Natural Born amongst genetically-altered Aristocrats, all Ella ever wanted was to be like everyone else. Augmented, sparkling, and perfect. Then…the crash. Devastated by her father’s death and struggling with her new physical limitations, Ella is terrified to learn she is not just alone, but little more than a prisoner.